Sarah Nader - snader@shawmedia.com Dan Masciullo (right) of Cary and his family, Tommy, 6, Molly, 4, and Karen all dine at Nick's Pizza & Pub in Crystal Lake on Sunday, March 18, 2012. Sarah Nader - snader@shawmedia.com P.J. 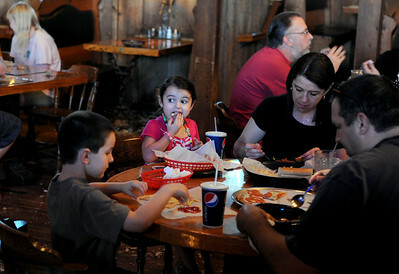 Weaver (left), 5, of Cary and his siblings, Ryan, 9, and Becca, 5, play video games while they wait for their pizza to arrive while having dinner at Nick's Pizza & Pub with their parents on Sunday, March 18, 2012. P.J. 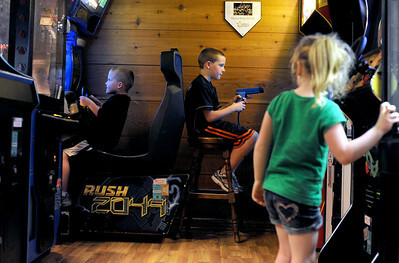 Weaver (left), 5, of Cary and his siblings, Ryan, 9, and Becca, 5, play video games while they wait for their pizza to arrive while having dinner at Nick's Pizza & Pub with their parents on Sunday, March 18, 2012.